Enjoy building and operating this massive 2-in-1 Bucket Wheel Excavator, the largest LEGO® Technic set to date! This awesome, meticulously detailed reproduction of a real-life mining excavator comes with a cool dark-blue and yellow color scheme and an array of authentic features and functions, including hand-railed walkways, huge tracks and a detailed cab. Switch on the included Power Functions motor and you can activate the conveyor belts, rotate the massive superstructure and maneuver the colossal machine into position. Then activate the boom to lower the gigantic, digging bucket wheel and convey the mined material to the waiting mine truck. When you feel like another building challenge, rebuild it into a Mobile Aggregate Processing Plant. Price is 5% below the initial Lego retail price, a € 10.43 discount! This comes down to 5.59 cent per brick. The Bucket Wheel Excavator (42055) Lego set is no longer directly available from the sites below. However, 3rd party partners of these sites might still have the set available. Alternate description Mine on a massive scale with the colossal Bucket Wheel Excavator, including motorised tracks, conveyor belts, bucket wheel and superstructure, plus a rugged mine truck. Erg leuke set, en ook perfect om daarna een GBC van te bouwen! 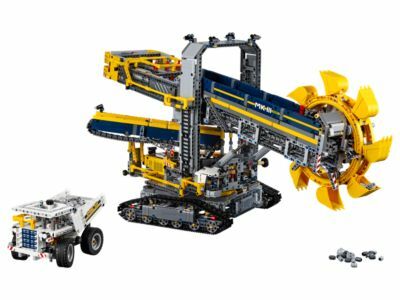 Features a LEGO® Power Functions motor for an array of motorised functions, including forward and reverse driving, rotating bucket wheel, moving conveyor belts and rotating superstructure, plus a working bucket wheel boom. Also features hand-railed walkways, lights, mined-material elements and a rugged mine truck. Switch on the LEGO® Power Functions motor and maneuver the huge tracked structure into position. Activate the motorised conveyor belts and bucket wheel. Move the joystick to rotate the massive superstructure. Raise and lower the huge bucket wheel boom. Follow the mined material from the bucket wheel to the moving conveyor belts and all the way to the waiting mine truck! This set includes over 3,900 pieces, making it the largest LEGO® Technic set to date. 2-in-1 model: rebuilds into a Mobile Aggregate Processing Plant. Bucket Wheel Excavator measures over 16” (41cm) high, 28” (72cm) long and 11” (29cm) wide. Mobile Aggregate Processing Plant with boom retracted measures over 8” (21cm) high, 34” (88cm) long and 8” (21cm) wide, and over 12” (33cm) high with boom extended. Mine Truck measures over 3” (10cm) high, 7” (19cm) long and 3” (10cm) wide.